Centuria is a roleplaying game which takes place in the fantasy world of Aladron across three different ages: the Age of Steel, the Age of Knowledge and the Age of Information. Follow posts about campaigns, world design and events or check out the downloads page for rule books and other material! Centuria is launching a new character generator, available here. While the functionality stays the same, under the hood its brand new and hopefully perceived as more user friendly. Not all pages have been migrated, so the old generator is still up and running (you can find it through a link available in the new generator) if you prefer to still use it. The might still be a few bugs present (just as in the old generator) so if you run into any please use the contact page and forward the information so it can be fixed! Updated family generation; parents of other races (more specifically dwarves, elves and gnomes) can now have a wider age span and the number of siblings are more in line with race descriptions. Off-topic note: It's been a while now since last post - lots of stuff going on (mostly on the positive side). But here's finally the finishing piece for the Developer Diary for the Age of Steel. Last out in this series of Age of Steel nations and civilizations are the Northern Dwarves - represented by the kingdom of Thzud. The kingdom of Thzud exists in the setting for two (three?) primary reasons: firstly, the already established Southern Dwarves are stated as colonies - thus a colonizing nation must exist. 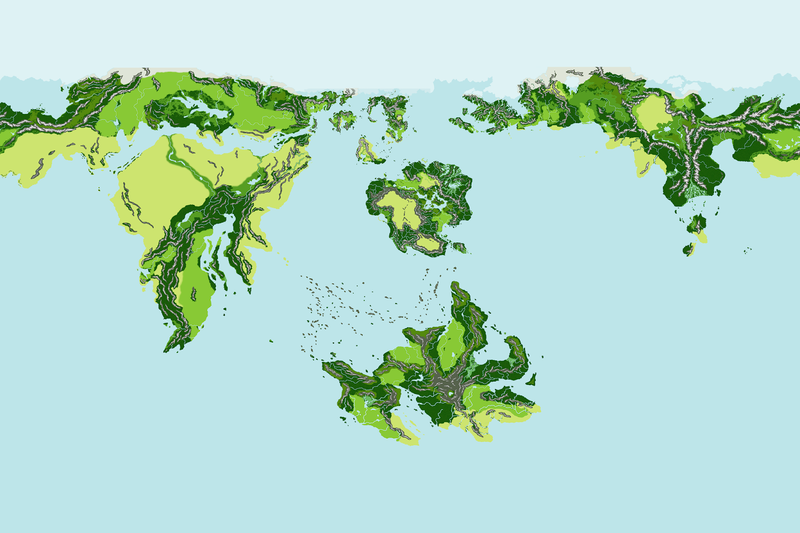 Secondly the human kindom of Cenowar is awfully isolated on the north-eastern coast so I needed some point of interest for it to interact with (apart from the monsters and mysteries of the Dark Forest). The hinted third reason is really a derivate from the first one; as the Southern Dwarves are colonies they lack some of the ancient luster that often surround dwarves in fantasy. Since that's an aspect I want available in the game, Thzud will fill that role. It is a rather straight forward idea - and also quite fitting - to imagine the northern dwarves as more extreme than their southern cousins. Their city is older (and thus grander and more populous), their traditions even more integrated into the fabric of society and their legacy puts them on the very top of the who-interprets-the-scriptures-correctly pecking order (though they are too distant to their southern cousins to enforce this viewpoint). To preserve the mystery of this kingdom, Thzud is chosen as an isolationist state. Granted that the most(?) logical explanation to having a whole city underground is that its people is seeking protection from the outside world this seems very plausible. However, to give the state an "in" into the game a limited trading contact with Cenowar is established. This doesn't seem unreasonable as Cenowar is also a very traditional state (at least by human standards) which has quite a few common viewpoints with the dwarves. The only other relation possible would be that with the elves to the west. Quite frankly I've left this one open with an abandoned dwarven city to separate the two. Was it a war? Or did the two races never meet as goblins overtook the dwarven outpost? Something else? Its just the sort of non-critical (from a game design point of view) relation I want to leave to a Game Master to develop to fit the preferred narrative. Not quite sure where it started, but somehow I ended up with an expansion module to give a short description of all the various regions of Aladron. The idea of this Atlas however is not to connect all the dots but rather supply threads and hints that a game master can use to create an interesting setting outside of Umarald that still feels connected to the rest of the world. It is at 27 pages perhaps better used as a dictionary than a read-through, though that is left to the choice of the reader. As usual it can be found on the downloads page. 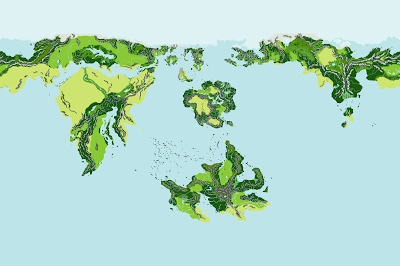 But, sticking to the news at hand its a lovely feeling to at last be able to present a completed world map! Hope you enjoy it! Just pushed out a small update of the Age of Information rule book, adding elite skills for the magical disciplines. Note that these additions aren't yet available in the character creator. Delving further into the nations of the Age of Steel we now come across the Orc Cities. These aren't a coherent state but rather independent city states - left overs from the ancient orc empire of Orchiag. In the Age of Steel, orcs are the enemies of practically all human kingdoms in the Northlands. Its a quite classical setup - and one I see little reason to change as there will be plenty of opportunity to turn the tables and put a big question mark on the whole racial war thing in later ages. Most fantasy settings contain traces of older civilization of some sort - not rarely grander than anything the world has to show at the current date. In Centuria I didn't want this; it should be a world that is moving forward - not looking backwards - as new inventions and ideas will lead on towards the Age of Knowledge. However, old ruins and fallen empires certainly have their charm - so I wanted some of that but without the classical stereotype. Now then, the orc cities were a result of solving two issues with one solution. By making that old fallen empire orcish in origin we provide rather tangible proof that orcs don't have to be wild beasts living in the forests (useful for explaining that race's later inclusion in civilized settings). And at the same time we get that old empire with a very good explanation as to why it's remains would stand apart and also why it fell in the first place. What is left as a problem to solve is how and why the remaining cities have managed to survive. Common sense suggest it should be due to a combination of mainly size and location - and possible to some extent local culture? 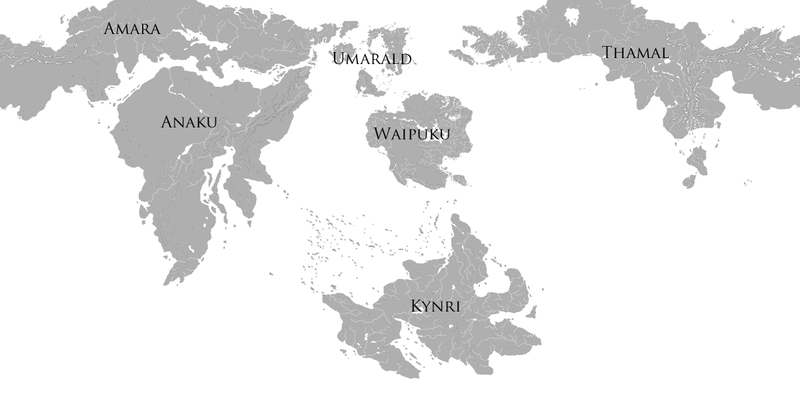 In the Age of Steel there is four orc cities remaining, from north to south: Rhegor-Thurk, Wierkrag, Nargor and Egarga. With the first two it is pretty easy to explain their survival; they are situated very far to the north and their only enemy is the nation of Gwendellor to the south, which is portrayed as sparsely populated and also quite focused on the conflict between Damasa and Menlor. Nargor, on the other hand, is surrounded on all sides by human lands (and also elves and gnomes). There is quite inhospitable terrain surrounding the city, but it still has to be pretty powerful in order to fend off invasions - given that its neighbors are unlikely to all be occupied elsewhere at once. Thus Nargor is the biggest and also militarily strongest of the orc cities. Lastly there's Egarga, situated far to the south. Here its location can explain quite a lot; it's situated quite far off from the human lands but within reach of the shortest sea trade route between Cenowar and the rest of the human nations of the Northlands. So it seems likely Egarga walks a balance between being able to support its population in such a remote location while still being strong enough to dissuade any direct military actions against it. The end result provide us with good insight not only into the cities themselves, but also into the political context of the surrounding lands. It also provides a lot of possibilities to build on in the next age! Alright; vacation's over and it's time to do some writing! This time it's all about Duiden: the small country with a big future (read about it in the Age of Knowledge)! 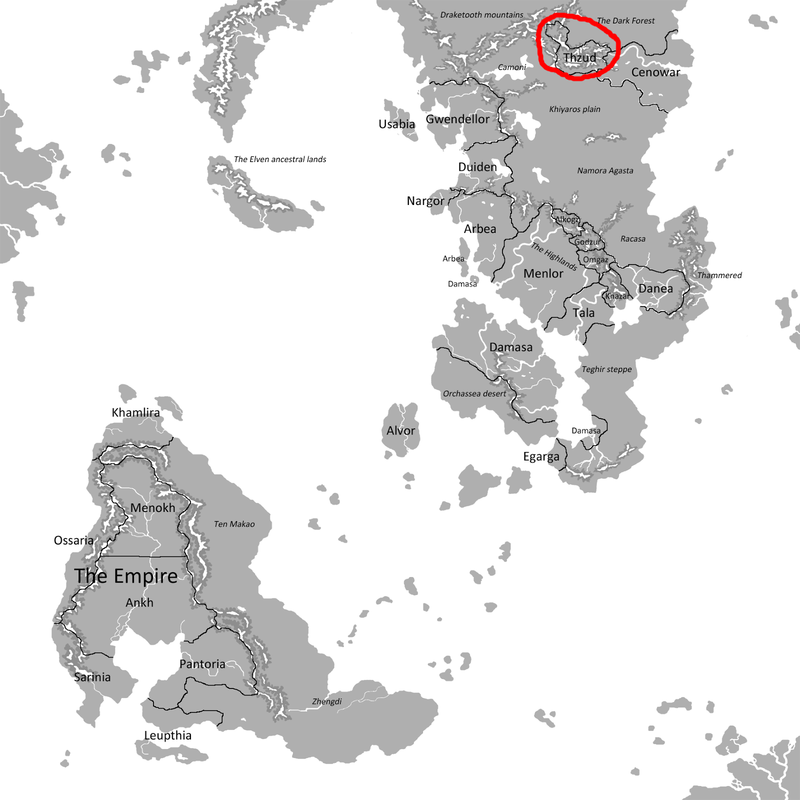 Duiden is located on the west coast of the Northlands. In the Age of Steel it is a rather backwards, if progressive, place. It's neighbors are Gwendellor to the north, Usabia to the northwest and Arbea to the south (though the Umo mountains lie between). Duiden is perhaps the best setting for a down-to-earth campaign as much of the country is wilderness or at least not densely populated. The people have banded together against nature and, perhaps more critically, the surrounding orc tribes. In Centuria, Duiden has about the same role as the Shire in Lord of the Rings; its the quiet homeland of the would-be heroes yet to experience the real dangers of the outside world. Its a place ment to portray a simple society where people, generally speaking, are trying to help each other and make for a better tomorrow. The challenges are of a practical nature and so are the solutions. Fitting Duiden into the world of Centuria poses some challenges. An explanation is needed as to why the general sentiment of the nation is different - especially given the rather extreme differences among their neighbors. And, as with any country, it needs a background to explain how it came to be. Thankfully, these difficulties come together to explain themselves. It seems most plausible that if the nation of Duiden is different in its culture then this is related to its history. With the war that tore apart the human empire, Duiden is geographically a good place to retreat to for those seeking to escape marauding armies. So a combination of not very organized settlers and war refugees making up the population explains both the sentiment and also the state of the nation as a whole. Nationhood is not a given status; it is a circumstance born out of necessity. As Gwendellor to the north was formed after the civil war it seems plausible for the Order of the Falcon to have attempted to establish itself in Duiden first (it being closer to Gothia) - but apparently failing (possibly - even likely - contributing to a stronger sense of unison among Duiden's inhabitants). This also gives a hint as to the continued relation between the Order and Duiden. The emerging picture is of a nation where those in charge came to be, not because they were powerful warriors or land holders, but because they were the sort of people that could get others to work together. They rule with the support of the people below them and know they stand to loose if that support should dwindle. The idea of a benign though perhaps not very advanced or powerful country arises quite easily from this train of thought. And this is where Duiden stands - and as for now it is all it needs to be. I'm a devoted writer and story-teller, having picked up roleplaying as a hobby in 2006 but with loads of experience from computer games prior to that. Happily engaged to my girlfriend Charlotte since May 2012. Works as a system developer for a small company in Motala, Sweden.